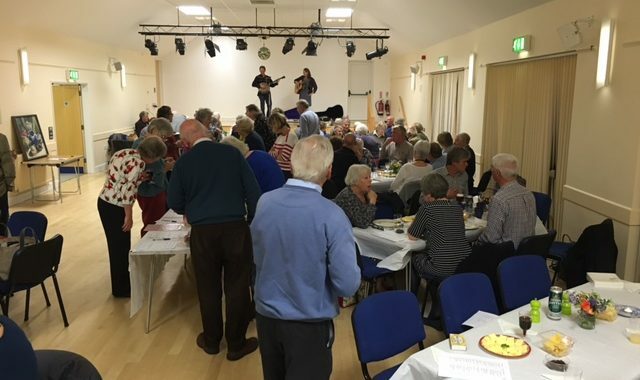 I am delighted to say that the Harvest Supper and silent auction raised £1,704.42 for the choir! We would like to thank the following companies for their generous contributions to our silent auction and musical harvest supper on Saturday 1st October 2016 at Cucklington Village Hall. Morrisons, Wincanton – Provided a voucher that helped towards the cost of some of the food. This is a very kind offer from one of our local supermarkets, which likes to support local charities. Incredible Edibles – Dinner cooked in your own home, for six. A brilliant offer from one of our own members and a local caterer. Keen’s Farm – A farm tour “From Grass to Cheese”, and a bumper wedge of cheese with two packs of butter. A generous offer from a busy company, whose prize winning cheese is much sought after in the best restaurants as well as locally. Ruth Kimber – A guided tour of the farm where traditional breeds of pigs are given play things, turkeys roam happily in the fields and cows are blessed on Rogation Sunday in the old way. Kimber’s Farm Shop is on the Bruton/Wincanton road. Roth Bar & Grill at Hauser & Wirth Gallery, Bruton – Afternoon tea for two. A chance to experience a relatively local new venture which is already internationally feted. Andrew Barclay, Butcher, Wincanton – A whole shoulder of lamb from this locally renowned butcher. Robin Price Studio – A wonderful computerised sketch of your home (either as a large picture or a series of notelets) together with the CD of the sketch to be used by the winner for their own enjoyment. Gartell Light Railway, Templecombe – A family ticket for an open day at this lovely local enterprise. Thomas the Tank Engine eat your heart out! Massimo Italian Restaurant, Gillingham – A £10 voucher towards a lunch/dinner. We would also like to thank all the kind donors of the choir who gave such lovely articles and experiences for the bidding, or provided salads, pudding and help. In addition we are very grateful to professional musician Mike Botteril for his guitar entertainment and bid offer of an hour’s free playing and William and Emily Roberts for their Blue Grass Duo. Posted in Event and tagged acknowledgements, Donations, fundraising, music, silent auction, social, social event, thanks.